What are the 7 Wonders of Zimbabwe? Zimbabwe is listed alphabetically as the last country in Africa, however it is not the last country of wonders and spectacular attractions. Zimbabwe features Africa’s only participant in the 7 Natural Wonders of the World. 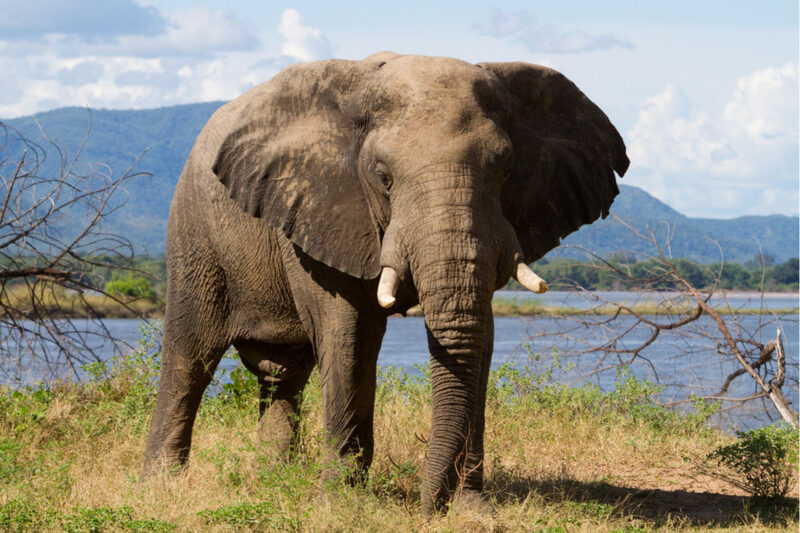 Zimbabwe is also a country rich in wildlife and nature encounters that will leave travelers wishing for more. Leading the way for Zimbabwe is Victoria Falls, which some believe is the most beautiful waterfall in the world. This aesthetic designation can be debated, however statistically speaking, Victoria Falls is the largest waterfall in the world. Victoria Fall extends along the top of the falls 5,604 feet (1,708 m) wide. 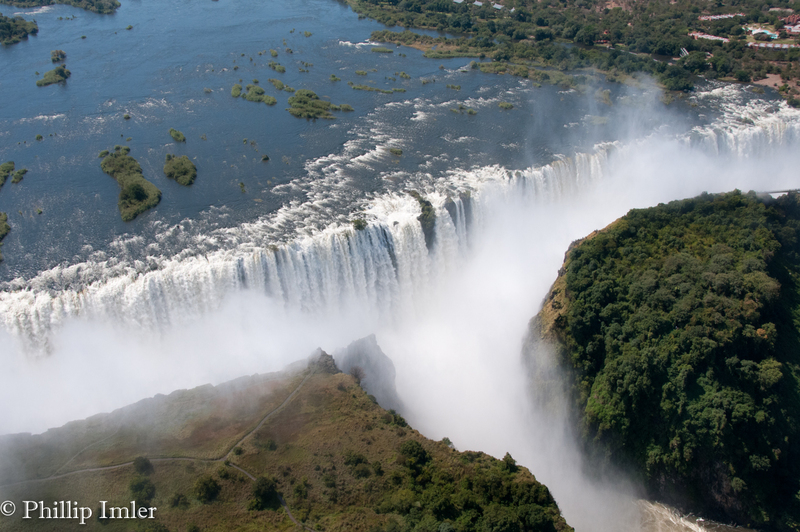 The Zambezi River plunges over the falls down a height of 354 feet (108 m). The width and height together create the largest single sheet of falling water. As the world’s largest waterfall, Victoria Falls is one of the Seven Natural Wonders of the World and Zimbabwe’s leading attraction. 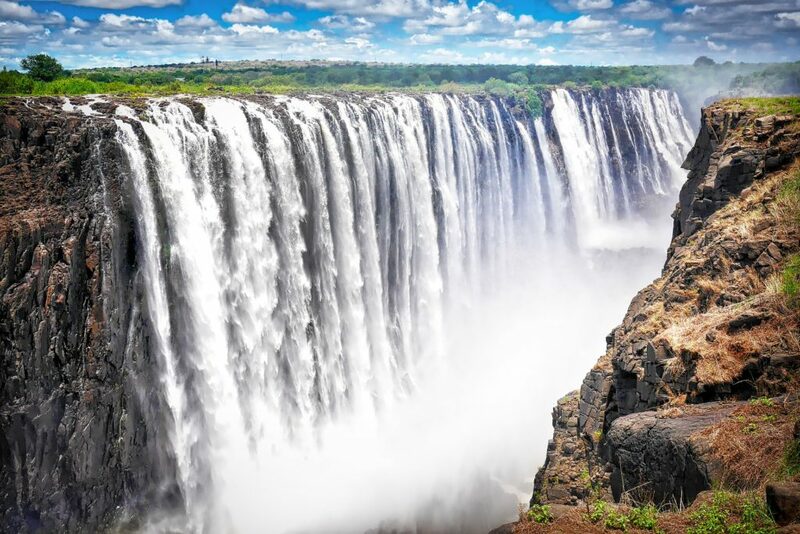 Victoria Falls is called Mosi-oa-Tunya in the local language, which means, “The Smoke that Thunders.” The falls drop down into the initial gorge, varying in height ranging from a 260 foot (80 m) drop to the highest point at 354 feet (108 m) creating the furthest drop. Travelers coming to Zimbabwe’s leading tourist destination are in for wonderful encounters with rainbows that are found in various places along the fall. An additional unique experience is the moonbows which may be experienced by travelers who come out to the falls during the evening while the full moon shines over the falls. Hwange National Park sprawls across 5,657 square miles (14,651 sq. km) creating the largest nature and game reserve throughout Zimbabwe. Hwange NP is located in the western part of Zimbabwe. 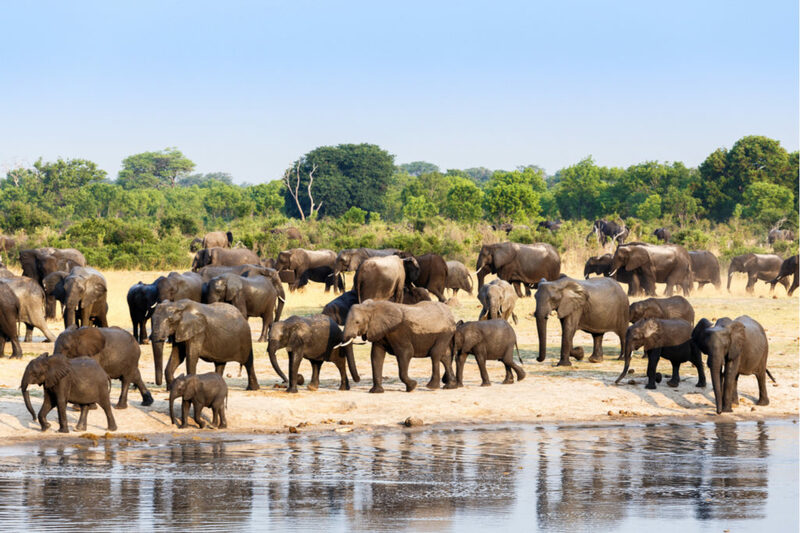 Hwange National Park is a wildlife haven featuring over 100 mammal species and over 400 bird species. One of the sought off wildlife sightings is of the rare Cape wild dogs, whereas Hwange has one of the larger surviving populations. Other predators include lion, cheetah, leopard, hyena and a few others. Hwange National Park is comprised of a base that is drown from the sands of the Kalahari. It has a variety of vegetation, granites, and lava flow creating a diverse terrain. The elephant population is strong, and travelers can also have hopes of seeing the gemsbok which has good numbers in the park. There are 18 additional large herbivores calling the park home. Travelers visiting the Hwange National Park will leave noting this to be a one of their favorite wildlife attractions. Lake Kariba is a man-made lake created by the Kariba Dam along the border of Zambia and Zimbabwe. The dam floods the Kariba Gorge creating the world’s largest manmade lake. 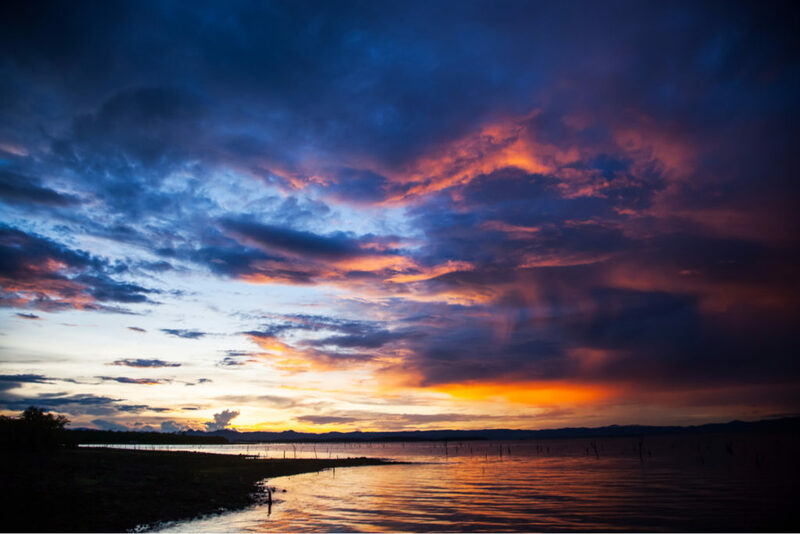 Lake Kariba stretches across a distance of 139 miles (223 km) in length, which is accompanied by a width of 25 miles (40 km). Together, this creates a surface area of 2,150 square miles (5,580 sq. km). The greatest depth of the lake is 318 feet (97 m) with the average depth coming in at 95 feet (29 m). Together, the volume of the water is 43 cubic miles (180 cubic km) creating the world’s largest manmade lake based on volume. Lake Kariba sets an at elevation of 1,591 feet 9485 m) above sea level. The lake has been populated with fish from Lake Tanganyika creating a popular tourist destination before scenery and outdoor activities like fishing and boating. The Mana Pools are a national park and wildlife conservation area located in northern Zimbabwe along the border of Zambia. The park runs parallel to Zambia’s Lower Zambezi National Park collectively creating an extensive wildlife protective area. The Mana Pools are created after the rainy season has turned the plains into various lakes. The lakes begin to dry up creating a series of pools that attract wildlife creating one of Africa’s greatest game viewing areas. The Mana Pools are home to the largest population of hippos and crocodiles. As the dry season approaches, the four permanent mana pools attract zebra, elephant, and buffalo. The presence of herbivores means a presence of predators. The Mana Pools are also home to lion, cheetah, leopard, hyena, and the Cape wild dog.